It takes equal parts of creativity and science to prepare a meal for family and friends. Start with a recipe, experiment with flavors and textures, and as your confidence grows, your signature culinary style emerges – like a stylish and functional pepper & salt grinder sets. 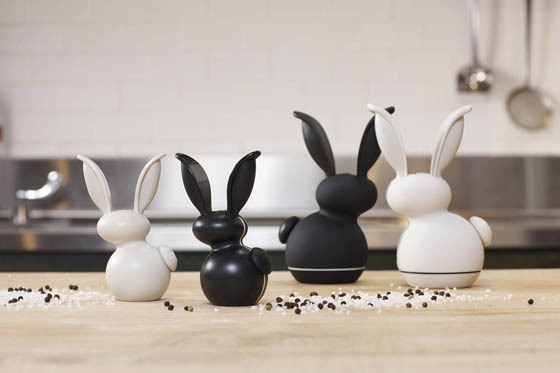 Here we have rounded up 13 Pepper & Salt Grinder Sets, sleek and elegant, funny and creative. If you want to look for something to spice up your table, do check this collection. It takes equal parts of creativity and science to prepare a meal for family and friends. “Orii” is derived from the word “original”. In this set spices are in harmonious balance. Ancient Concept melds separate spices into a greater whole. 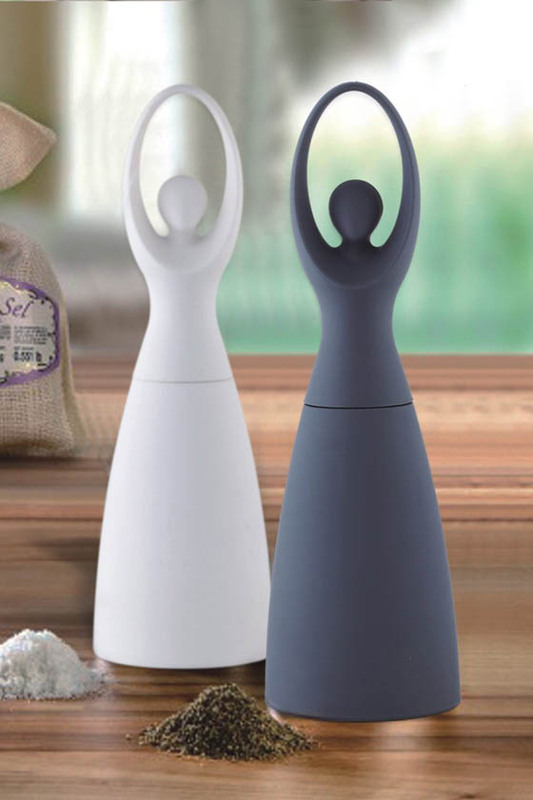 Sleek and elegant salt & pepper mills in the form of white and black ballerinas. Turn her body grind. 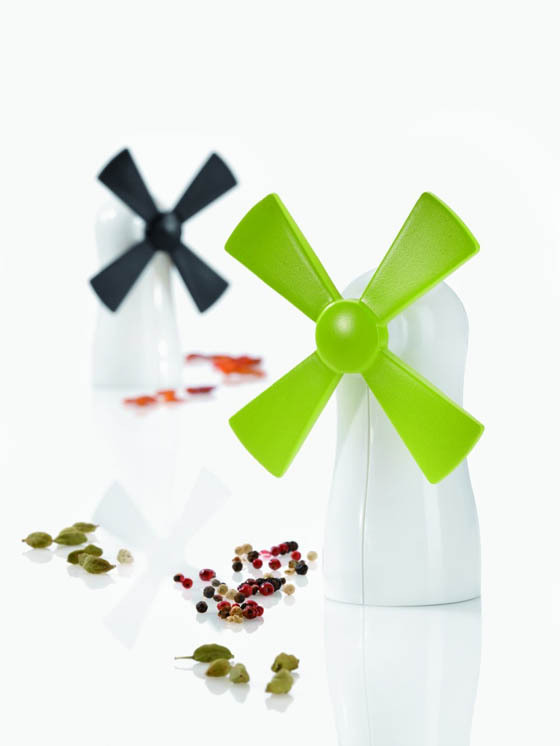 Never before has a spice mill appeared in such an iconic shape – and it just couldn’t be more reliable or easy to use. The powerful ceramic grinding apparatus will cut salt, pepper, cardamom, dried chilies and lots of other spices down to size. And not just any size: the cutting consistency is continuously adjustable. How to season with one hand busy stirring the pot? Every chef knows the dilemma. 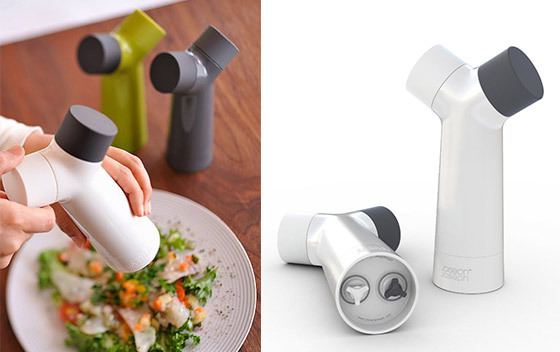 With the Bistro Gravity salt and pepper grinder it doesn’t get any easier: tilt the grinder over the pot and it does it all by itself. A ball inside the grinder sets the electric grinder in motion once it’s angled – all you have to do is pick whether you want pepper or salt. The grinder works for other spices as well. 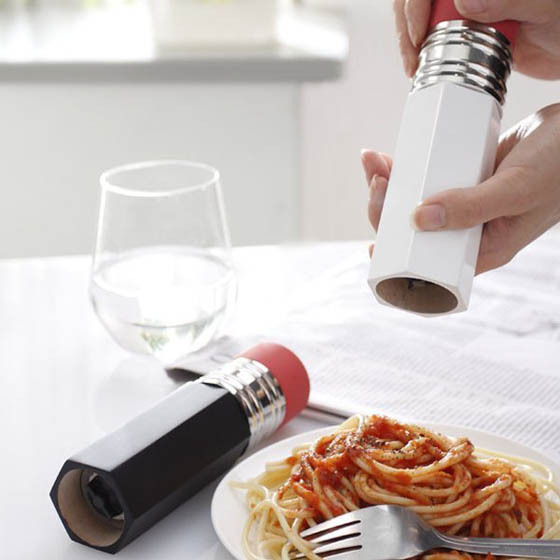 Both, the salt and the pepper grinder are adjustable in fineness and they’re easily refilled by lifting the grinder’s cap. Available in black, orange, red and green. Requires 6-AAA batteries, not included. 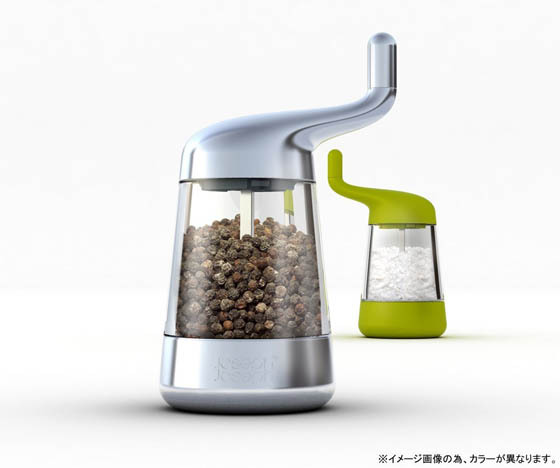 The winner of interior innovation award 2014 & good design award, look touch taste is a patented spice grinder carrying the curvy shape of a bell. At its bottom there is a patented collecting pool which gathers the ground spices . 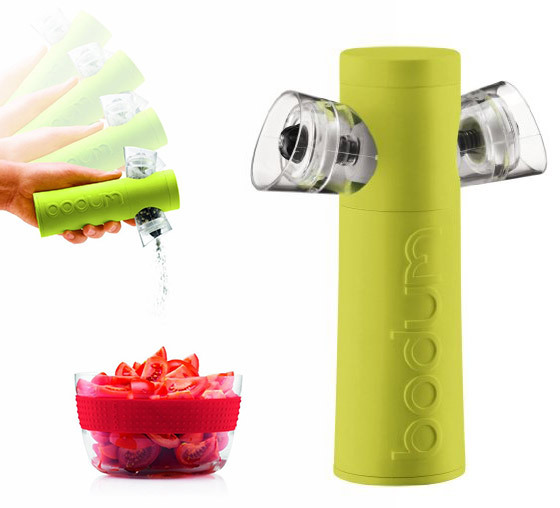 By tapping it, you can direct the desired amount of spices where you want it! with an elegant outer design, this grinder is so much more. It includes a ceramic grinder mechanism that has passed a durability test equal to 200 yrs. Usage in a normal household. Spices can be ground with no risk of oxidization or any other chemical reaction affecting aroma or flavor. The grinder settings can be adjusted on the stainless steel cap which is printed with the Audi logo. 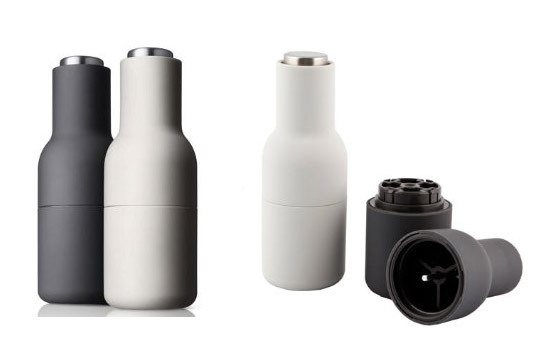 The minimalist form of the salt and pepper mills ensures a clean operation and crumb-free storage. The infinitely adjustable ceramic grinders can grind sea salt and pepper corns very easy. This sophisticated set comprises a pepper mill with a light grey surface and a salt mill with a dark grey soft touch surface. Get a Right & Left hand grinder. Have one for salt and one for pepper. 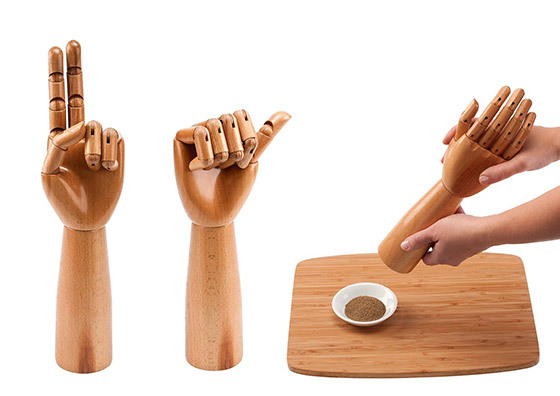 Home Toolz “Handy” Pepper & Salt Mill, designed by Howard Locker, is reminiscent of artist’s hand models. 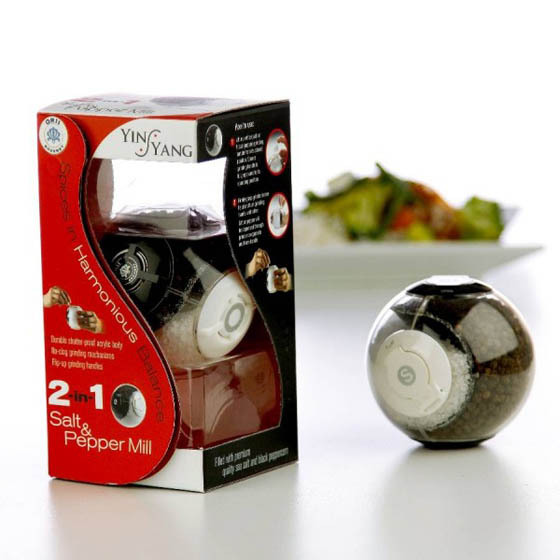 It’s made of solid hardwood and features a ceramic grinding mechanism suitable for pepper or salt. Each mill is hand finished to ensure only the highest quality in craftsmanship. Since each mill is made from wood, no two mills will have the same grain patterns. The fingers on the hand can be moved into various positions. This mill is a great conversation piece. The “hand” separates from the base exposing an interior cavity that can be filled with pepper or salt. The grinding mechanism is manufactured using high-tech ceramic material, and is suitable for grinding peppercorns, large dry salt crystals or sea salt. The smooth contours of this stylish Wind & Grind salt and pepper mill echo its simple operation and trouble-free maintenance. Its high-quality ceramic mechanism can be adjusted to grind from fine to coarse grades and can also cope effortlessly with a variety of other whole seeds and spices. The acrylic body allows you to see when the contents are running low and the unit is easy to clean and refill. These unique, innovative Pencil Grinders are beautifully designed and extremely useful in the home. Made of wood and stainless steel, with a rubber paint finish at the top, each set contains two grinders. This distinctive salt and pepper mill has a unique twin-chamber design, allowing both salt and pepper to be dispensed from the same stylish unit. Hold the body of the mill in one hand and twist either of the two grinding knobs to release salt or pepper. Suitable for grinding all types of seasoning, including rock salt, it can be easily adjusted to grind from coarse to fine grain. 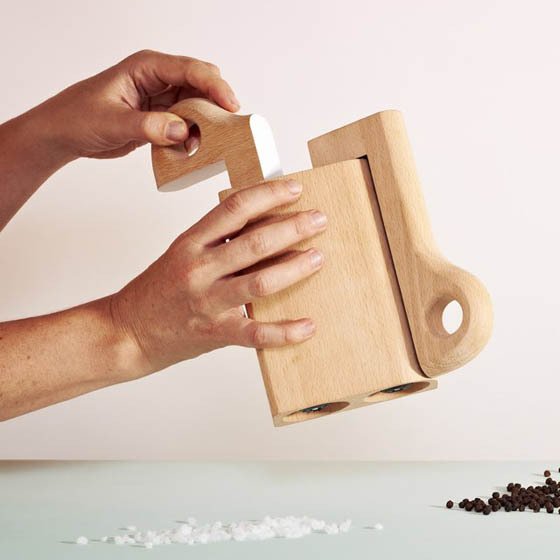 The Crank Grinder holds both salt and pepper in one tool – a beautiful blending of toy and industrial languages inspired by the Italian Memphis movement. Made of Beech Wood, it measures 9 x 7 x 2 inches. 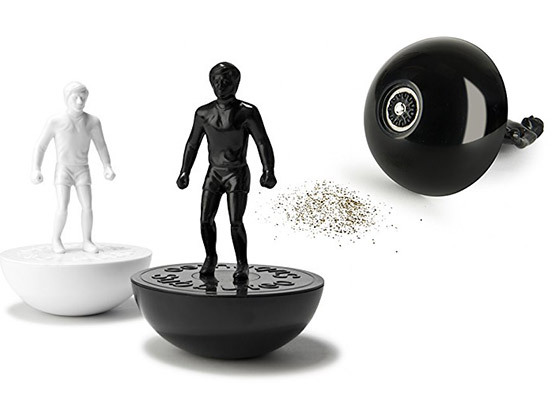 Pass the salt (and pepper) in style with these iconic Subbuteo Salt Pepper Grinders! These officially licensed grinders are made to the highest quality, with a durable ceramic mechanism to ensure meals are perfect season after season! G’Rabbit has been super popular for several reasons – it’s cute, it can be used with one hand and it has a long lasting, sturdy construction. Features include an adjustable grind mechanism so you can have a fine to course grind (and anywhere in between), ergonomic handles and a super sharp ceramic rasp. G’Rabbit comes ready to use; filled with fresh sea salt. By Chef’n. Chef’n began over twenty years ago based on the principle that kitchen products could be a lot smarter, easier and more fun. Right from day one, Chef’n found an audience hungry for its brand of tasteful ingenuity.